Other photos: Flybridge helm covers, Flybridge seating covers, Flybridge helm, Flybridge helm, Flybridge helm, Flybridge controls, Flybridge seating, Salon, looking forward, Salon, looking to port, Salon, looking aft, Galley, Galley, RPH helm, RPH helm, RPH controls, RPH flybrige stairs, VIP forward, VIP head, Bunks to starboard, Bunks, Master, Master, Master, Master, Master head, Day head, Stackable washer/dryer, Cockpit, Cockpit, Cockpit, Cockpit, Engine room, 63' 2002 Hatteras 63 MY. Madeira is a freshwater Hatteras 63’ used for summer months, and then put in heated storage for polishing and care. This is the only freshwater 6300 RPH available and as such is set apart from the salt water offerings. It is very clean, very fast and very custom. 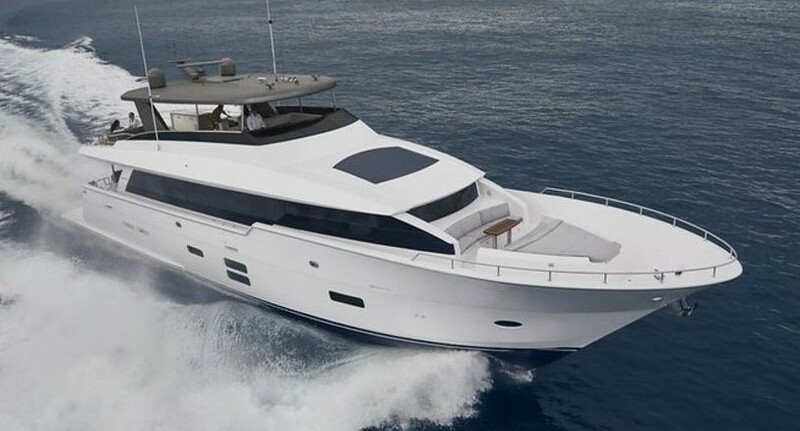 Incredibly low hours at just over 1400, on this one owner Hatteras. This vessel is hull number 10, and the first in the series with a larger saloon. Over $90,000 of customs by Jarrett Bay makes this 63 more elegant and functional than any other 63. Customs include: a custom L shape sofa and two upholstered chairs that make the saloon roomier; a wine cooler and wine glass storage; a flat screen TV on a cabinet lift; stunning use of burled mahogany on table and cabinet tops; his and hers cedar lined closets in the master stateroom; a safe; unique bow locker storage for six large fenders and lines; Gagenau electric grill on the fly bridge; aft deck control station; a back-up fuel transfer pump; new whisper-quiet head pumps; phantom retractable screens on the aft, and side doors; oversized American bow thruster equipment; well thought-out electronics with redundancy; XM radio throughout the ship; digitally tuned props; Sunbrella canvas; aft deck anchor. No detail was overlooked by the owner. These customs are so well designed and built; you will be convinced they were done at the factory. The engine room is detailed annually and welcomes your inspection and survey. Annual oil sample tests from CAT show the engines and generator are in top condition and get the best care. PAR reports available as well as a complete maintenance history. The Caterpillar 1000 hour service was performed in May of 2018. The choice of fabrics and colors are contemporary and tasteful, and in like-new condition. No expense has been spared to keep this 63 “as new”. If you are an experienced owner/operator, you will appreciate the many details, large and small that this ship has. If you want to spend time on a 63, and be as comfortable as possible, this is your best opportunity. SYS Yacht Sales is pleased to assist you in the purchase of this vessel. This boat is centrally listed by Walstrom Marine Harbor Springs.